Japanese Episode AG 102: "Umi no Otoko! Shi Ten'nou Genji Toujou!!" American Episode 373: "Vanity Affair"
Now that Satoshi has seven Houen League Gym Badges, the young trainer has developed a bit of an overconfidence problem. After he defeats a trainer with a Hassamu, Satoshi declares that he is ready to take on any opponent who comes his way. Enter Genji of the Four Heavenly Kings. 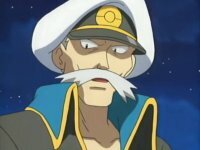 The elite dragon-type trainer saw Satoshi's earlier battle and is impressed with the young man, so he challenges him to a pokemon battle aboard his pirate ship. There, the two trainers battle, with Genji using a Komoru while Satoshi uses his Pikachu. At first, Genji's pokemon doesn't budge at all, making Satoshi think that Pikachu's speed attacks will be enough to defeat it. However, Genji eventually comes through as the victor when he orders his pokemon to use a series of attacks that knock Pikachu out. Komoru's high defense enable Genji to monitor Satoshi's battling technique and enabled him to attack at the best possible moment. The second battle pits Genji's Tyltalis against Satoshi's Juptoru. Satoshi's grass-type uses the ship's masts to jump around on, but even this bit of quick thinking can't earn Satoshi a victory. Juptoru is knocked out, costing Satoshi the battle. After Genji defeats the Rocket-Dan, who appear to kidnap Satoshi's Pikachu, he tells Satoshi that he fought well. After receiving some advice from the Four Heavenly Kings member, Satoshi is able to continue his journey with a new understanding of pokemon battling. The anime doesn't seem to like the Four Heavenly Kings at all. It seems like the anime producers would rather showcase random trainer after random trainer than give the equivalent of the video games' final bosses any on-screen time. Why do we have to get a hundred episodes into the region before we even get so much of a mention of the Houen region's four top trainers? Fans will applaud this episode because Satoshi gets a "reality check," but I don't see why that's such a big deal. I mean, Satoshi hasn't shown any sign of overconfidence since his first match with Touki, so it's not like he's been begging for someone to knock him down a peg or anything. Satoshi's pigheadedness was really only present in this episode, so I find it harder to applaud the destruction of this character flaw than I would if this had been an ongoing thing. The dubbed version isn't anything too special. I wish Eric Stuart and Rachel Lillis would stop putting on those godawful French accents whenever their characters are in any sort of maid-type outfits, but other than that the dub's up to its usual standard. And two seconds are removed from the episode's title screen. This one's really minor, but in the original, Genji orders a hot milk with sugar. In the dub, he orders a hot milk with peppermint. Notice how the referee for the Drake vs. Ash match is the same "captain" from the Master Quest episode "Hoenn Alone?" A second is cut right after the Trainer's Choice commercial break. Two seconds are trimmed from the shot right after the final commercial break. And two seconds are removed from the TO BE CONTINUED... screen.